With two young kids, a mortgage and graduate-school debt among other obligations, the Elsners were concerned whether they are doing enough to deal with their financial challenges. An expert’s assessment — pretty good, but there’s some room to improve. Financial challenges are commonplace for young couples who are starting careers, buying homes and raising children. Just ask the Elsner family. They have middle-income salaries in an expensive city, and two young sons. They are gradually fixing up a 1950s home in Southwest Seattle and making mortgage payments that could last into the 2040s. Their combined debt of $310,000 weighs on them. The family’s cash balances often sink uncomfortably low between paydays. IF YOU WOULD BE INTERESTED in a free financial makeover in exchange for having your story and photo published in The Seattle Times, answer a few questions at seattletimes.com/yourmoneysurvey. “We do live paycheck to paycheck,” said Dana Beaudry Elsner, 36. But their situation, though stressful, is not as dire as they believed. A volunteer financial planner who examined their finances found several strengths. She also came up with an action plan for easing their immediate pressures and keeping them on a path to financial security. “For where they are in life, they’re pretty well balanced,” said Trish Howe, a certified financial planner in Seattle’s Fremont neighborhood. The Elsners are Seattle-area natives who stayed home and became members of the city’s middle class. Brian Elsner, 37, is the athletic director and a history and economics teacher at Seattle Preparatory School. His wife works 20 hours a week as a museum educator at the Burke Museum at the University of Washington. Both supplement their earnings by coaching youth sports teams. Their combined annual income is about $94,000 a year. Making ends meet every month is a family preoccupation. The Elsners are raising two lively boys, ages 5 and 2. They are making payments on a $270,000 mortgage. Other debts include a $21,000 subsidized loan for energy improvements to their home, a $13,000 student loan for Brian Elsner’s graduate degree and $6,300 in credit-card debt. Saving money is a challenge, and the family did not have a reserve fund for emergencies. The Elsners debate among themselves whether they are frugal, although they are disciplined spenders. Both drive cars that are more than 10 years old and paid for. They spend little on clothes. Looking for some relief from the money grind, the couple asked for help. The Puget Sound Chapter of the Financial Planning Association voluntarily connected the family with Howe. Howe discovered that the family’s debts were “good” debts because the money was spent on things that gain value over time — in this case, the couple’s home and Brian Elsner’s graduate degree, which increased his salary. The credit-card debt paid for remodeling the family’s bathroom. Another good sign: Both the Elsners love their jobs and participate in their employers’ retirement plans. Brian Elsner has $115,000 in his 403(b) retirement plan, while Dana Beaudry Elsner has $11,000 saved with the state Public Employees Retirement System. The Elsners are building wealth with their home. They were apartment dwellers in 2009, when a relative in real estate urged them to buy a house. At the time, home values were deeply discounted because of the 2008 financial panic. They bought their home near Westwood Village for $289,000 in 2009. Today, Zillow estimates the market value at $414,000. Doing the math, Howe concluded the Elsners have a net worth of about $215,700. Howe urged the couple to consolidate their debts and establish a source of money for emergencies by getting a home-equity line of credit, or HELOC. The Elsners are doing so. When their HELOC is approved, they plan to save money on interest payments by borrowing from the HELOC at 5 percent interest and using the money to pay off their credit-card debt, which is at 7.5 percent. The Elsners also are refinancing their home with a new, 30-year mortgage with a fixed interest rate of 4 percent, down from 4.5 percent on their current mortgage. That should save the couple about $170 a month. As a bonus, the Elsners will be able to end their mortgage-insurance payments when they refinance because of their increased equity in their home. They’ll also use their new, lower-interest mortgage to pay off their energy loan, with its interest rate of 4.25 percent. Among other things, Howe urged the Elsners to use another vehicle to save money for college for their boys. 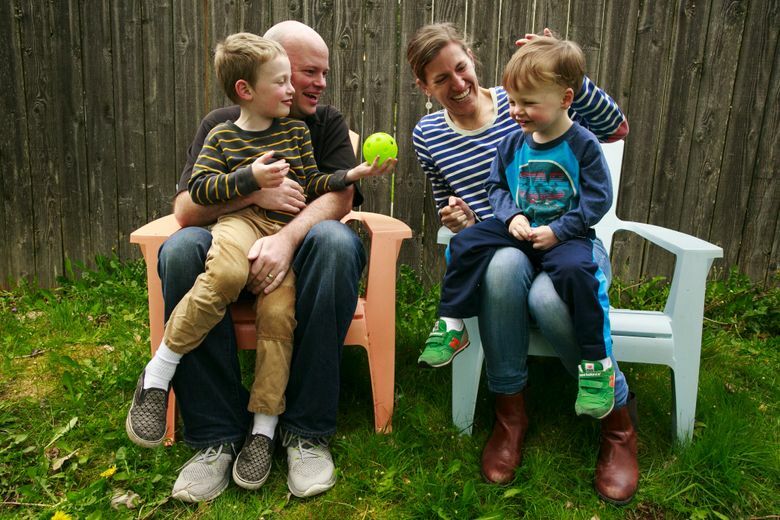 The couple have saved about $600 for their oldest son by using Washington state’s Guaranteed Tuition Education (GET) program. But the program was put on hold in 2015 when the state Legislature cut tuition at the state’s public universities after years of tuition increases. The Elsners were also frustrated with GET’s cumbersome website. Howe recommending switching to New York state’s 529 College Savings Program, which offers direct investing and Vanguard Group funds known for their low fees. The Elsners can also transfer the money in their GET account to the New York program without getting dinged by taxes. The Elsners found Howe’s analysis reassuring, and her measured approach to paying down debt eased some of their worries.